Raw sewage from the communities served by the South Central Wastewater Authority Treatment Plant enters the facilities from three separate sewer force mains. From that point the wastewater sequentially flows through various tanks and equipment, each unit designed to remove a specific category of solid material or other type of pollutant from the flowstream. Some pollutants are dissolved (or soluble) in the water and require biological conversion to a solid residue for their removal. Naturally occurring bacteria growing in the aeration tanks use this soluble material for food and convert it to solid material which is then removed from the wastewater and further treated by a separate process. The liquid portion is oxidized and nitrified in the aeration tanks and solids are removed in the clarifiers. The clear effluent is disinfected before being discharged into the Appomattox River. Wastewater entering the South Central Wastewater Authority Treatment Plant contains approximately 150 milligrams per liter (mg/l) of suspended solids and 210 mg/l of biochemical oxygen demand (BOD), and in addition, up to 16 mg/l of ammonia and 5 mg/l of phosphorus. The Virginia Department of Environmental Quality has required that the Authority discharge less than 30 mg/l or suspended solids, 16.8 mg/l of BOD, 1.8 mg/l of ammonia and 2.0 mg/l of phosphorus as well as a number of other restrictions to maintain the water quality in the Appomattox River. Solid residue removed from the wastewater is pumped to thickening and dewatering facilities which concentrate the solids to approximately 20% solids (80% water). 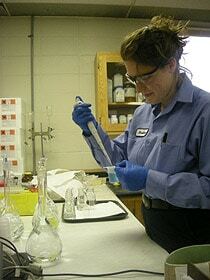 The solids are then mixed with lime which raises the pH of the material to provide stabilization. The mixture is further dried on a covered storage pad before being safely spread on land. The Industrial Pretreatment Program is designed to protect the municipal wastewater treatment facility and the environment from adverse impacts that could occur when hazardous or toxic wastes are discharged to the sanitary sewer. Industrial customers seeking information regarding the Industrial Pretreatment Program should contact the Industrial Pretreatment Coordinator. The South Central Wastewater Authority (SCWWA) issues permits and accepts hauled liquid waste. Liquid waste only originating from locations within 15 miles of our member boundaries is accepted. Our members include the Cities of Petersburg and Colonial Heights and the Counties of Chesterfield, Dinwiddie, and Prince George. All parties wishing to discharge hauled liquid waste at the SCWWA must complete an application form and obtain a permit. All haulers are expected to abide by the Hauled Waste Rules and Regulations and a completed manifest form is required for each discharge. The discharge location is at the SCWWA, 900 Magazine Rd., Petersburg, VA 23803 and liquid waste is accepted between the hours of 6 am and 8 pm Monday through Saturday except for Holidays observed by the SCWWA. The vehicle is weighed before and after discharge. The difference in weight is calculated in terms of volume and billed monthly. 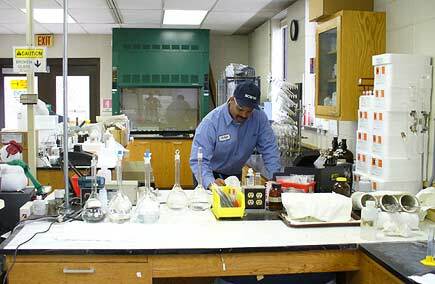 The Wastewater Laboratory performs test methods for conventional pollutants and nutrients along with quality assurance and technical support for operations. Federal and state regulations guide the certified activities of the laboratory for reporting of analytical results in compliance with the facility VPDES Permit. Prevent sewer backups and overflows. Keep grease out of your sewer lines. Grease that is washed down sinks, toilets, or other drains can cool and stick to the sides of the sewer lines (both on private property and on public lines). Over time, it can build up and cause the line to be blocked. When that happens, raw sewage can overflow onto yards, streets, sidewalks, or parking areas and may reach storm drains and discharge to waterways. It also may back up into homes and businesses. An expensive cleanup process, especially if it backs up into homes or businesses. Property owners are often required to pay for these cleanups. An increase in maintenance costs for local sewer departments, leading to higher sewer bills. Garbage disposals do not reduce grease. Also, relying on hot water or detergent is ineffective. 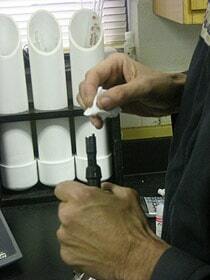 These only move the grease further down the line to cause problems elsewhere. Never pour grease down sinks, toilets, or other drains. Pour grease in a can or other disposable container and place in the trash. Scrape food scraps and grease into the trash before washing dishes. Use baskets or strainers in sink drains to catch food scraps and empty them into the trash. If you run a restaurant or other food preparation facility, inspect/clean your grease trap monthly. An improperly maintained grease trap can be a major source of grease in sewer lines. Mention these steps to friends and neighbors and encourage them to do the same. Please remember, sewer service lines for a home or business are most often the responsibility of the property owner. Any cleanups resulting in backups in these lines are likely to be at the property owner’s cost. This includes backups resulting from improperly maintained grease traps. This could include backups on neighboring properties if the source of the backup is determined to be a neighboring home or business.